Researchers from Northwestern University’s Rogers Research Group have developed a wearable biometric sensor that collects and analyzes athlete’s sweat, even while they are swimming underwater for prolonged periods. Our sweat carries a host of chemical information about our bodies, such as salt, sugar, hormones, drug, alcohol, and electrolyte levels, which are indicative of our overall health. Just like other demanding physical activities, swimming makes us sweat even while underwater, but there hasn’t been an effective way to collect and analyze it while under water. 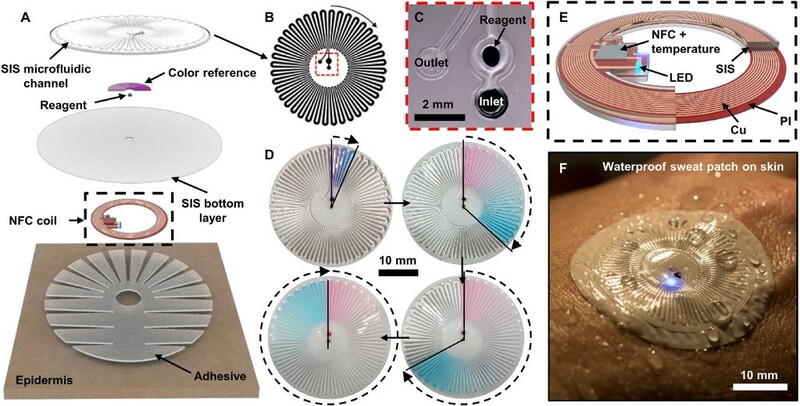 The researchers’ sweat sensor features a waterproof elastomeric moldable polymer circular patch that’s deformable and adheres to skin no matter the conditions. The underside of the patch has a tiny hole that allows sweat to enter; while a myriad of separate microfluidic channels push the sweat to an internal sensor where it is analyzed. An embedded NFC chip can then transmit the data to a mobile device that medical professionals can use to view the results. Each microfluidic channel serves as different miniature test lab — with one for fluid levels, another for chloride concentration, another for sweat loss, and so forth. The sweat is mixed with different chemicals within the micro-channels, causing it to change different colors, each representing that specific test, allowing athletes to see body chemistry changes in real-time. 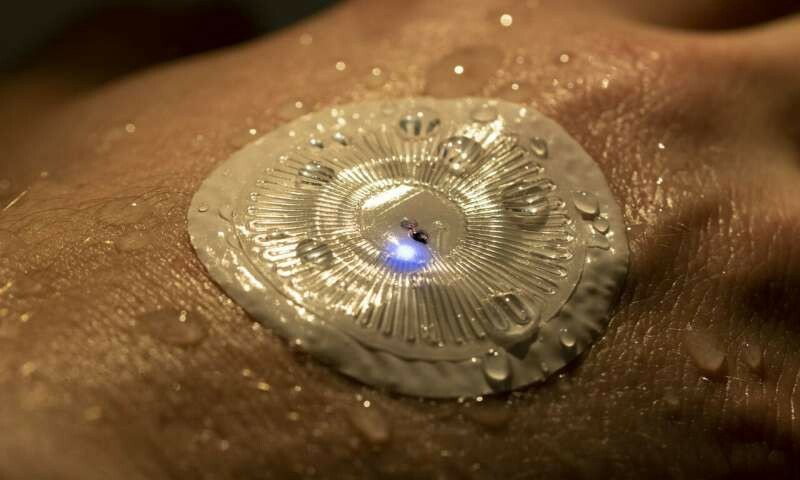 Besides sending the collected data wirelessly to a mobile device for further analysis, the wearer could also take a pic of the patch, and an app could tell them if they need to drink more water or risk dehydration, something that can happen even while swimming. The wearable sweat sensors are already in clinical use at the Lurie Children’s Hospital in Chicago, where they are used to screen newborns for cystic fibrosis through measuring chloride levels in their sweat. They will also be fielded to athletes to put them through ‘extreme test-cases’ before they become available to the market. Waterproof Chemical Sensor Collects Biometric Data During Water Sports was originally published in Hackster Blog on Medium, where people are continuing the conversation by highlighting and responding to this story.